Walks in the country in this period have a particular effect on our moods. The first impression is that of being immersed in a sleeping world: the lack of leaves in the vineyard makes it seem that nature is resting. Varying tonalities of brown follow one after another and the scents of the earth seem anaesthetized. It’s the winter effect. For those who love country living, even this season has its charm. For those who work in the abovementioned charming countryside, this is the season in which many decisions are made. In the vineyard, even how much each single plant will produce is determined. This because it’s time for pruning, one of the most important operations carried out in the vineyard during the winter, and the operation through which we begin to regulate the future production of the vineyard. Here at Brolio, we plant our vineyards in the spurred cordon formation. By pruning very close to the trunk, the bud load is limited to 6-8 per plant. This regulates the yield to about 1 kg of grapes for each single grape plant. Thanks to our experimentations with mapping in the past, we are able to manage the bud load per plant based on the soil in which the vineyard is located. In this way, we obtain the greatest quality without wearing out the plant itself. Pruning vineyards is a very delicate job that requires sensitivity. For this reason, it’s assigned to a trustworthy team of much-valued women who organize the cordons in the first three years of the plants’ lives. 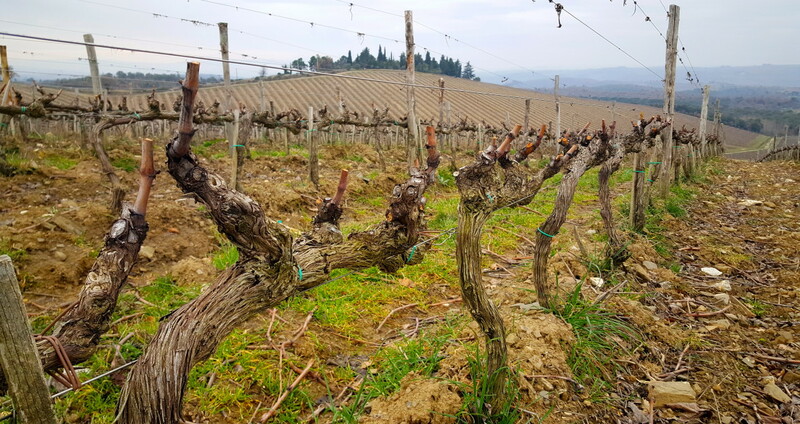 But even in the following years, the grapevines have to be cared for and pruned as needed, and our valued women, armed with gloves and shears, defy the bad weather of the coldest months in order to pamper the vineyards and prepare the vintage. The least we can do is thank them!